I love the nursery that E is attending. She goes twice a week - Monday afternoons and all day on a Wednesday - so I can get some work done. She has a fabulous time and even after mashing her finger, she'll come home with a smile on her face. The staff are great and they've helped to introduce E to some new foods as well. I do find that she'll eat a lot of things at nursery that she turns her nose up to at home, which is frustrating but at least she's eating. 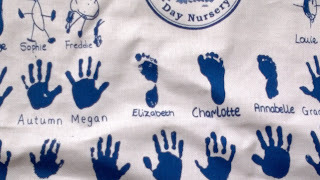 I bought E's first piece of nursery memorabilia today. 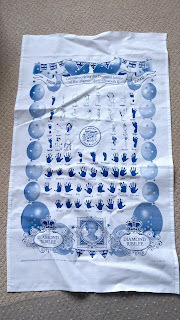 It's a tea towel with all the nursery children's drawings on. E's class are too small to draw a picture of themselves so they have either a hand or footprint. So very cute! It's the first thing that we've been given the option to buy but I know that this is just the start. As she gets older, it'll get worse as well. There'll be fancy dress days that you donate money for and cake sales where you buy back your own cakes. There's school photos as well and you don't want to forget what your child looked like when they were 7 so you buy the school photo every year. The school trips - oh the school trips! They get bigger and better as the child gets older, so I'm guessing they get more expensive too. I already knew all this, I'm prepared for it, but I wasn't expecting it to start at the grand ol' age of 16 months. Now I understand why the cost of raising a child is so high. In the meantime, I'll enjoy smiling every time I look at my new tea towel.